We stayed at Rua Assunçao, no.99 . We loved the interior with minimalis modern style. The interior and the facilities in the apartment. Very spacious and comfortable. The location is very strategic and near all the tourist spots and restaurants. All in walking distance. 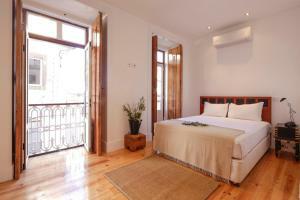 Location and apartment were great for a downtown Lisbon stay. Location and the apartment itself was actually really nice and clean. The Location is great to stay. And the apartment is fantastic,very tidy and bigger than most of others.Also the staffs are so nice and warm. I must choose it again for next time. Excellent location and super comfortable apartment. Staff was nice and responsive. We loved this apartment so much we didn't want to leave! Very comfortable furnishings, spectacular location and view from living room. Would stay here again. The property management was extremely helpful and accommodating. The apartment had recently been updated and was very spacious and nicely decorated. We were in a convenient location close to shopping, restaurants, bars and landmarks but it was a quiet street at night. Location is great, price is good, apartment was very comfortable, modern, spacious. The decor was good, very large room, excellent kitchen facilities. The property location was excellent. Lock in a great price for Bairro Alto Apartments by linc – rated 8.2 by recent guests! One of our best sellers in Lisbon! 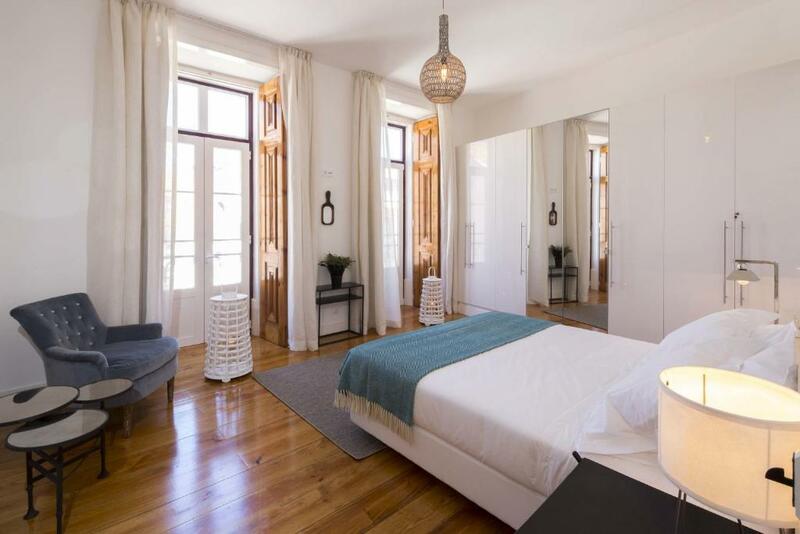 Located in the Bohemian quarter of Lisbon, Bairro Alto Apartments by linc offers modern, fully-equipped apartments with a spacious living and dining area. Restauradores Square and Coliseu dos Recreios are within a 10-minute walk. Each individually decorated apartment features a separate seating and dining area and a kitchen featuring a washing machine and dishwasher. All have a luxury bathroom with a shower. Free Wi-Fi is available throughout and some apartments come with a private terrace. 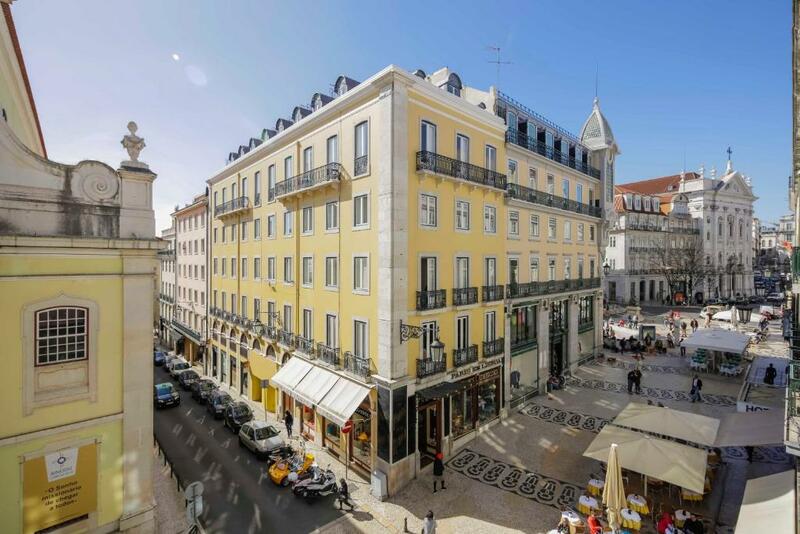 The Bairro Alto Apartments by linc is within 10 minutes’ walking distance to cafés, restaurants and bars which offer local and international cuisine and entertainment. 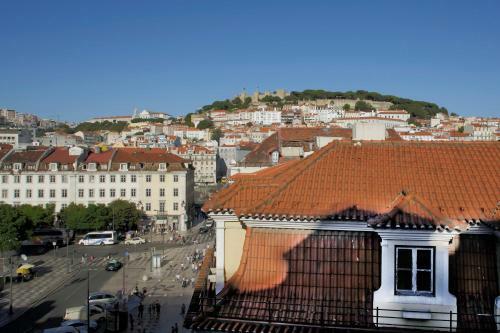 Guests can visit museums and walk through the cobbled streets of the old town of Bairro Alto. The Bairro Alto Apartments has metro and train stations within a 5-minute walk. Lisbon Airport is a 20-minute drive away. An airport shuttle is available upon request. 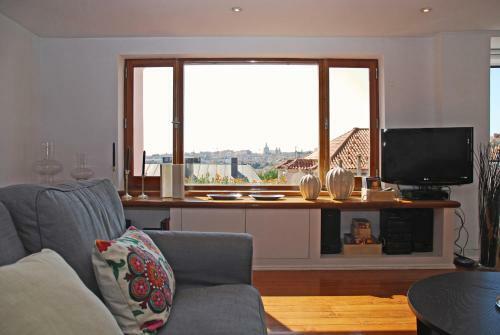 When would you like to stay at Bairro Alto Apartments by linc? This large modern apartment features a separate seating and dining area with a flat-screen TV. There is a fully equipped kitchen with a washing machine and dishwasher. 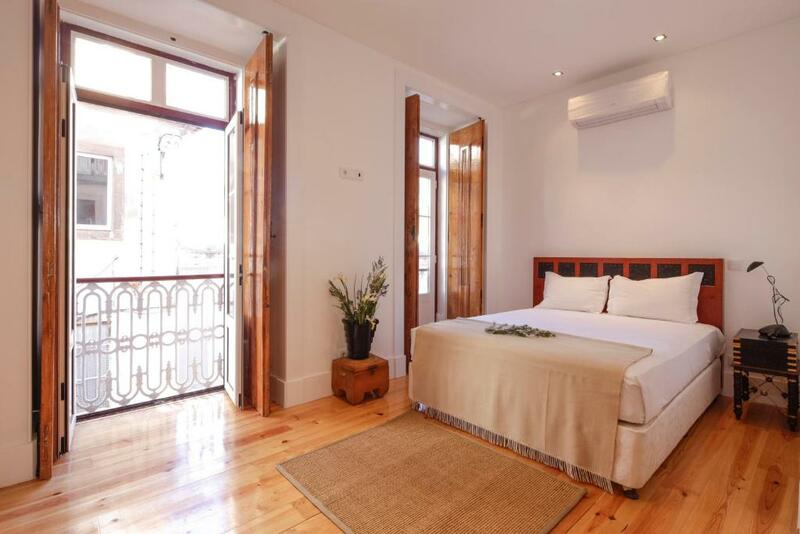 This very spacious modern apartment features a private furnished terrace. It has a separate seating and dining area with a flat-screen TV and a fully equipped kitchen. It also has a washing machine and dishwasher. Featuring a furnished terrace with panoramic city and river views, this bright and modern apartment has wooden floors and exposed wooden beams. The large living room has sofas and a dining table and there is a wide kitchen with tiled floor. Spread over 2 floors, the apartment has a modern black-marble bathroom and an additional toilet. This brand-new duplex apartment in a recovered building with direct view to Rossio Square. Featuring air-conditioning, this bright and spacious 2-floor apartment comes with a private bathroom, kitchen and free WiFi access. This apartment features a dishwasher, patio and seating area. This apartment has a microwave, dining area and sofa. This apartment features a dishwasher, fireplace and oven. This apartment features a flat-screen TV, microwave and sofa. This apartment has a oven, washing machine and seating area. 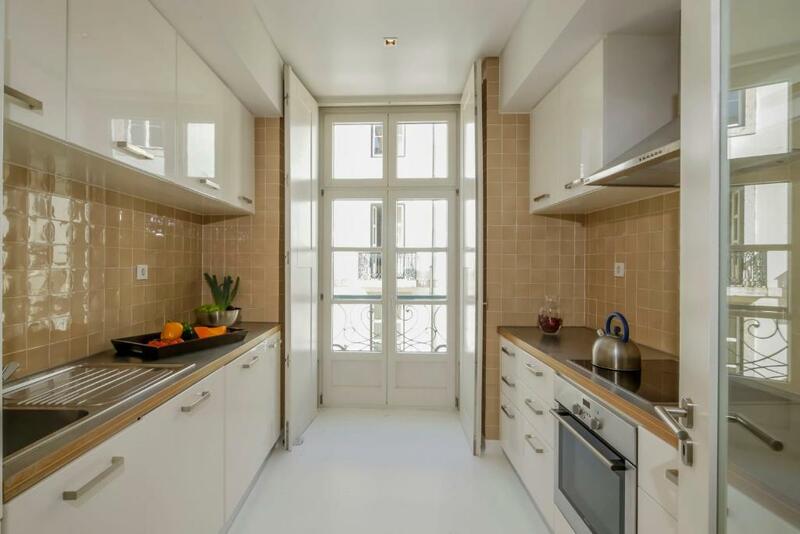 This apartment features a dishwasher, kitchenware and dining area. This apartment has a sofa, cable TV and washing machine. This apartment features a dining area, seating area and patio. This apartment has a dishwasher, washing machine and oven. This apartment features a dishwasher, stovetop and air conditioning. 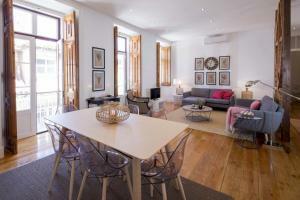 House Rules Bairro Alto Apartments by linc takes special requests – add in the next step! Bairro Alto Apartments by linc accepts these cards and reserves the right to temporarily hold an amount prior to arrival. Please note that there is a late check-in fee of EUR 25 for arrivals between 22:00 and 00:00. Please note that there is a late check-in fee of EUR 45 for arrivals between 00:00 and 07:59. Please note that there is a late check-out fee of EUR 25 for check-out after 11:00 and between 16:00, subject to availability. Please note that extra towels are available at an extra cost of EUR 25. Please also note that an additional cleaning can be requested, at an extra cost of EUR 40. Accommodation was good. Few things could have been there still: we missed a coffee machine. Problem with broken shower head was fixed in a few hours. Location in the heart of the city is great. The smell in the apartment was constantly there. It smelled like the drains had not been cleaned with the smell permeating the apartment. It was very noisy. More effort can be made to insulate the apartment. The location is great but it’s difficult to sleep at night as we could not open the windows for fresh air. Very noisy outside from construction work- this continued until late in the evening and through the night sometimes. Therefore could not have the windows open in the evening. One bathroom was not available - apparently the door handle was broken. No hot water in the apartment on one morning, had to have cold showers!! Excellent location, very close to Metro station. The name Barrio Alto apartments was a bit misleading as it was not in Barrio Alto but a 10 to 15 minute walk away. Apartment was on third floor which wasn't good if you break your leg on the first night of your stay which is what I did so was unable to get out due to no lift in property. On the plus side nice apartment if you have to spend your whole weekend break in it. Apartment large and spacious. Clean and minimalist. Finding the apartment was tricky, possibly because we came by train and then got a cab from Santa Apolonia that dropped us off in the wrong location. The apartment does not have a name outside that I could see, so that didn’t help. The apartment is very clean, the showers need a good mold cleaner and a scrub around the base of the shower to get the black off which I was surprised to see considering how clean the rest of the bathroom and apartment was. The apartment was very spacious and comfortable, excellent views all around of the streets and the amazing church opposite. Although it was in a very busy area, it was very quiet once inside and I did not hear any other people that were staying in the other apartments, very well sound proofed! It had everything there that you may need, I would have loved to have stayed for longer than 2 nights and would definitely stay here again. Nothing. We really enjoy our stay. The lights in the bathroom did not work, no facecloths. The wait to get the key was a bit long. The sofa could be a bit more confortable when used as a bed. Very well isolated from the noise outside! Very well located. The view was wonderful. Close to everything. The street where it is located is not very clean and good looking. Nice flat. Confy. It is located in the City Center of Lisbon, very close to the most turistic places. The flat is very big and it is clean. We booked another apparemment than the one we have been assigned. Keep in mind Linc has a lot of properties and migh assign you something else than what you booked on booking. We mentioned it and they specified to us to contact them first before booking anything. We needed a step free access to the appartment and surprise there was a one level of steep stairs before the elevator. That was a problem for us because we were traveling with elderly less valid people who could not climb easily stairs. A few things in the place didn't work like a lamp, or the hairdryer which would not give any hot air (just cold) but those problems were solved with Linc who was very available, but I t would be more professional to have those details checked beforehand. Despite we didn't book the apartment at that address, and despite the fact we needed a step free access to the apartment, the place was very very nice. 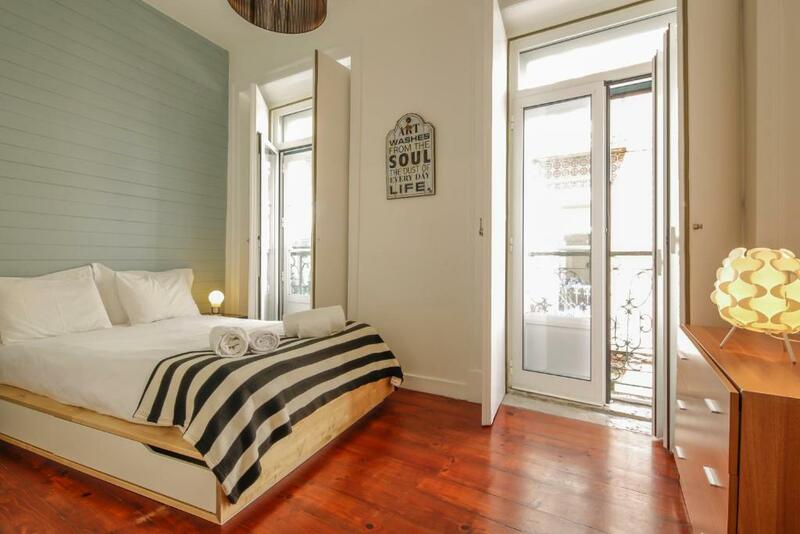 A beautiful apartment, in a beautiful blue tile house in the heart of Lisboa. We appreciated a lot having a starter kit in the kitchen with dishwasher tablets, washing machine detergent, sponges etc. That was great! The sofa was very comfortable to sleep on, and the street quiet at night. We didn't have to wait to get the keys of the apartment, the person from Linc was very ponctual. we stayed at no 97.. very bright and spacious. the host came back and lend us the EU adaptor.. many thanks!